When iconic restaurants open branches in Las Vegas you would think it would be time for excitement. But lately, such legends as Trader Vics, Serendipity 3 and Pink’s have made their way to our humble burg, and we couldn’t be less enthused. (Trader Vic’s has already closed btw).That’s because what brings them here isn’t a desire to replicate what made these places special (the seediness of Pink’s, Serendipity’s urban oasis, Trader Vic’s kitsch-y Polynesian cool), but rather, a deal. In this, these restaurants resemble movie sequels. They represent a cold-hearted, corporate deal, made with all the passion of a tax return, intended to boost the bottom line by attempting to mimic the formula that made them successful in the first place. And in most cases, they fail. That doesn’t mean they don’t make money — Serendipity 3 is packed day and night, and the Pellegino’s of Rao’s fame are laughing all the way to the bank — but in place of charm you get the big Vegas bj, and some times it works, and sometimes it doesn’t (e.g. Trader Vic’s, which had all of the charm of a bus station). The consortium of bean counters (or whatever) that owns the Trader Vic brand these days is planning to reopen a full restaurant in Los Angeles soon. (For the past few years, this iconic name has existed in LaLa Land solely as a generic hotel bar in the Beverly Hilton.) Let’s hope they learn from their mistakes, but given the corporate imagination (or lack thereof) that characterizes the types of companies that buy these names with plans to “extend the brand,” we’re guessing they won’t. But let’s be candid about this — the reasons Friday’s are dying on the vine everywhere else (precooked, lousy food, tacky decor, fake smiles, outdated everything) make them perfect for Vegas casinos. 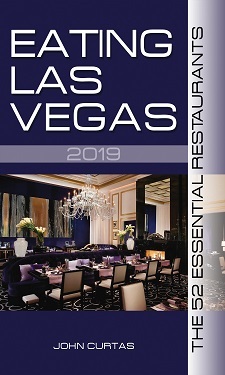 For Vegas is nothing but a copy of a copy, and our restaurants (most of them anyway) and the turistas that dine in them, embrace that ethos, no matter what decade they sprang from. Las Vegas, Nevada (June 12, 2009) – In August 2009, legendary Hollywood hotspot, Pink’s Hot Dogs will open a new location in Las Vegas. Pink’s Hot Dogs Las Vegas will be located within Planet Hollywood Resort & Casino, at the south end of the property and directly accessible to foot traffic walking along Las Vegas Blvd. Pink’s Hot Dogs Las Vegas will be holding a job fair in July and is expecting to hire between 30 to 35 people for positions that will range from bartenders to line cooks and managers. Approaching their 70th Anniversary, Pink’s originated in Los Angeles as a family-owned hot dog stand in 1939 and evolved into a West Coast icon. Pink’s is known as “Home of the World’s Best Chili Dog,” a title earned for the recipe specially developed by founder, Betty Pink. The hot dogs are all beef with natural casing and make a mouth-watering snap when you sink in your teeth. Enjoyed for years by Hollywood celebrities ranging from Robert Goulet to Snoop Dog, Pink’s hot dogs have become a cultural phenomenon and can be ordered in dozens of delicious variations. The 1,900 sq. ft., Las Vegas hot dog joint will offer 14 varieties of hot dogs, including its top dogs: the Stretch Chili Cheese Dog, Chicago Polish Dog and Rosie O’Donnell Long Island Dog. In addition to the hot dogs, other delectable items will be served such as burgers with sides such as fries, coleslaw and chips and salsa. Exclusive to the Las Vegas location, Pink’s will offer alcoholic beverages to their customers, as well as indoor and outdoor seating. * Actually, the snake’s head was found in some vegetables accompanying the sandwich. Details, details…. I don’t know too much about Serendipity, however Pink’s is GREAT!!! I’m very excited about one opening here in Vegas. Look, with the economy in the crapper lots of “finer dining” places are closing. It seems to me that places like Pink’s will help with the tourists as well as locals who want good quality without the high price. John, you gotta try it!!! You will not be disappointed. Pinks ROCKS!!!! why would the uptight douche bag “ELV” try a hotdog, he is far too good for that, unless of course he will get it for free. such a blowhard, in this economy he should be praising a small business for creating new jobs, i guess if you arent a NYC so called celeb chef/restarantuer you no good in his eyes. dude… harsh. Seems 2b some internal anger. Look into that, it’s not healthy. I know, even a man as lofted as our friend elv here can get down on a dog or two, when they are done well. Seems like he has more of a problem with pre-packed, unoriginal, heat-and-eat restaurants like TGI and in Pink’s case… well Pink’s is a nice dog but you know it’s going to be a rip-off and the question is: can it live up to the original? It’s not about being a NYC chef… it’s about putting out a quality product. I love the 10″ chili dog and fries from Pink’s, and I’m happy they are moving to Vegas! There is nothing cold hearted about spreading the original recipes and flavors to new cities for more people to enjoy! Don’t knock it ’til you’ve tried it, Pink’s is AWESOME! I think it’ll be awesome to grab a legendary Pink’s hotdog during a walk down the strip! How can you mess up a hotdog recipe, it’s classic?! Tourists will love it, and it’s opening will create more jobs for the Las Vegas unemployed. Long live Pink’s! When I look at the writer, he screams of a bent out of shape guy who never made it in the industry so he has to take his poison pen (or in this case keyboard) and slam hard working people who open these dining establishments. It seems he is attempting to ruin their reputations before they even begin. Despite being part of a franchise or not, they are creating jobs in the Vegas area and that is VERY important in these times. Critics like this are what is wrong with journalism and why newspapers are a dead medium. Now, ANYONE can blog and be self important. Sorry for the rant, but I can’t stand reading negativity like this article who only looks for the bad in a situation. BOO HOO!!! Poor you guys, ELV is soooooooo mean. I fail to see the source of this “outrage.” His point is recreations of cool places hardly ever live up to the expectation. Vic’s was an example. Now we’ll see how Pink’s stacks up. The “in this economy” stuff is garbage. Yeah great, jobs for 30-35 people at Pink’s that’s great. I would argue that “in this economy” the critic would be wise to advise readers to avoid wasting their hard earned money on inferior product. It’s kinda like the “shop local” mantra, if your going to go out for dinner don’t waste it on pre-packaged garbage like Friday’s. What good is a critic if he’s not critical? I rather read someone who will lay people out and actually criticize. Personally, ELV is a bit to easy on people sometimes… I wish he would be a bit rougher. And right, this is what’s killing newspapers. Your argument is flawed Joe, the dailies are dying because news moves to quickly for papers to keep up. Critics are the only thing right with journalism today. Maybe a more critical eye, a more vocal voice of dissent would be a positive influence on our world. Maybe if we had more people willing to call a spade a spade we wouldn’t be overrun with crap places that feed you from a bag. He’s easy on people that comp his tab……give this douche a free meal and he will give you 5 stars. That’s really harsh. How can you critique a restaurant that hasn’t opened, or compare a product you haven’t sampled to the original? Check out Pink’s when it opens, and then let me know what you think! It’s not harsh or unfair to ask the question… will it be as good? It’s a valid question. Obviously, I’ll try it, and I hope it’s as good, but until I see for myself I’m skeptical… that’s just where I default to. BTW- I’d just like to point out that saying “this douche” will only 5 star you for a free meal is coming dangerously close to an ad hominem attack. If you don’t like his opinion that’s one thing. Personal attacks take away from the substance of your argument… actually, I don’t see any reasoned argument… just he’s a douch, he’s a blowhard. Doesn’t really add any strength to your argument. Again, I say… Search within yourself to discover the source of your hostility aggression and anger. Geez Louise food fans! We thought everyone would be yakking about yakking over a snake’s head in a sandwich. Instead, everyone is incensed that I bagged on Pink’s before it opens. FYI: Planet Hollywood has been serving “Pink’s” hot dogs in its coffee shop for over a year now. They are but a shell of what the originals taste like — missing as they do the lagniappe of urban grime that informs the ones you get on La Brea in L.A.. The point is: no matter what they import here, it’s going to be a facsimile of the original — which I have tasted many times. Sure the dogs might be the same, and the buns, and the toppings (doubt it), but it still won’t be the same experience. And don’t mess with the Zohan playa haters…unless you can back it up…which you can’t. And thanks Dean-O for the support. when it opens then by all means you can praise or slam all you want. Well we went to Pinks on opening day here in Las Vegas! Over priced! a combo meal for $15.00, and it didn’t taste better than hotdog on a stick in the mall! Are you freaking kidding me! They will never see me there again, and I will of course spread the word. Save your money, and go to applebees or something where you can buy a meal for 2 for $20.00 instead of 2 hotdogs fries and a drink for $29.00!